[144 Pages Report] The global switchgear market was valued at USD 84.14 Billion in 2016 and is expected to grow at a CAGR of 7.12%, from 2017 to 2022. Increasing access to electricity in developing countries, continuous growth of construction and developmental activities, and growth in renewable power generation projects are the major drivers that would trigger growth in the switchgear market. This research study involved the use of extensive secondary sources, directories, and databases, such as Hoover’s, Bloomberg BusinessWeek, Factiva, and OneSource, to identify and collect information useful for a technical, market-oriented, and commercial study of the global switchgear market. Primary sources are mainly industry experts from core and related industries, OEMs, vendors, suppliers, technology developers, alliances, and organizations related to all the segments of this industry’s value chain. The points given below explain the research methodology. The switchgear ecosystem comprises equipment manufacturers, such as, ABB, Ltd. (Switzerland), General Electric Company (US), Schneider Electric SE (France), EATON CORPORATION plc (Ireland), Siemens AG (Germany), Larsen & Toubro, Ltd. (India), Alstom SA (France), Hitachi, Ltd. (Japan), CG Power and Industrial Solutions Limited (India), Efacec Power Solutions – S.G.P.S. S.A. (Portugal), ELEKTROBUDOWA SA GROUP (Poland), Hawker Siddeley Switchgear Ltd. (UK), Hyosung Corporation (South Korea), Mitsubishi Electric Corporation (Japan), and Toshiba Corporation (Japan) among others. 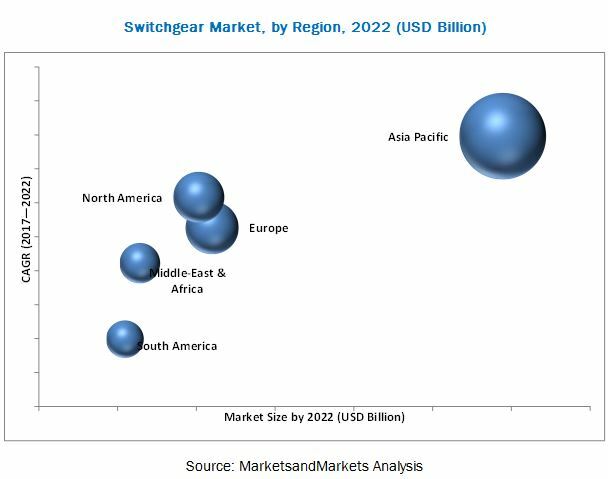 The global switchgear market is projected to grow at a CAGR of 7.12%, from 2017 to 2022, to reach a market size of USD 125.10 Billion by 2022. Continuous demand for construction and developmental activities, increasing access for electricity in developing countries, and growth in renewable power generation projects are the major drivers of the switchgear market. The report segments the switchgear market, by voltage, into < 1 KV, 1–36 kV, 36–72.5 kV, and > 72 kV. The voltage capacity of the > 72.5 kV sub-segment dominated the voltage segment in 2016 due to increasing electrical sub-stations in transmission and distribution network and protection of the electrical circuit equipment at high voltages. 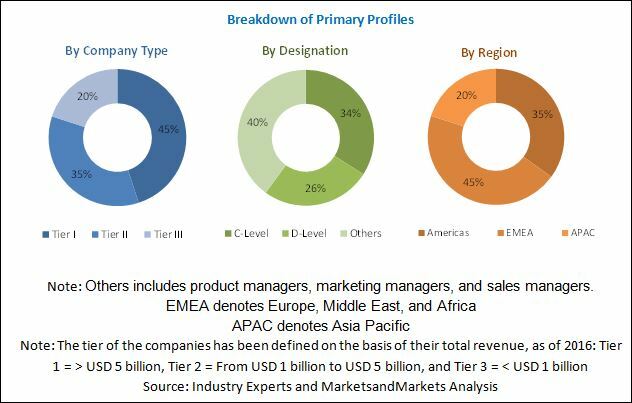 Based on the end-user segment, the switchgear market is segmented into transmission and distribution utilities, manufacturing and process industries, commercial and residential infrastructure, and others. Others include marine, transportation, and mining sectors. The transmission and distribution utilities sub-segment led the switchgear market in 2016 and is projected to dominate the market during the forecast period. The transmission and distribution utilities segment is expected to grow at the fastest rate during the forecast period. Based on equipment, the switchgear market is segmented into gas insulated switchgear, air insulated switchgear, and circuit breakers. Gas insulated switchgear held the largest market share in 2016 and is projected to dominate the market during the forecast period due to its space optimization, low maintenance, and protection against external elements. SF6 is used as an arc quenching and insulation medium for gas insulated switchgear that provides environmental advantages over other switchgears. In this report, the switchgear market has been analyzed with respect to five regions, namely, Asia Pacific, Europe, North America, the Middle East and Africa, and South America. The market in Asia Pacific is expected to lead the global switchgear market during the forecast period due to the upgradation of aging electrical grid infrastructure and increase in electricity demand in the region. Aging power infrastructure, HVDC transmission networks, and upcoming smart cities can lead to opportunities in the switchgear market. Stringent environmental and safety regulations for SF6 switchgears and increasing competition from the unorganized sector of the switchgear market could be a restraint for the switchgear market, leading to declining profits. Some of the leading players in the switchgear market include ABB Ltd. (Switzerland), General Electric Company (US), Siemens AG (Germany), EATON CORPORATION plc (Ireland), and Schneider Electric SE (France). Contracts & agreements and new product launches were the most adopted strategies by players to ensure their dominance in the market. 11.7 Hyundai Heavy Industries Co., Ltd.
11.19 Lucy Electric UK Ltd.
11.20 Hawker Siddeley Switchgear Ltd.